There are many essential oils that can help rid of a cold or flu virus and help to give you relief from coughs, sore throat, and congestion. The soothing effect of many essential oils can also help treat body aches and pains, chills, headaches and other flu and cold symptoms. The antimicrobial and healing properties of many essential oils can help to destroy flu and cold viruses and speed up your recovery time. The decongestant effect of some essential oils also helps unblock stuffy noses and help clear your respiratory system from mucus and phlegm. The common cold or flu infections are spread by sneezing, coughing, or touching surfaces that an infected person has touched, and then transmitting the virus to your nose or mouth. Apart from causing you to have a sore throat, persistent cough, or congested sinuses, the cold and flu can leave you feeling tired and fatigued. Essential oils like tea tree oil, lavender oil, and cinnamon oil have an antiviral effect on cold and flu viruses. However, the refreshing scent of lavender oil or lemongrass essential oil can also rejuvenate your mind and help you feel that you have more energy. Also, peppermint oil and eucalyptus essential oil act like expectorants to unclog stuffy sinuses and break up mucus. Many essential oils also relieve flu and cold symptoms due to their power to soothe aching joints and muscles. 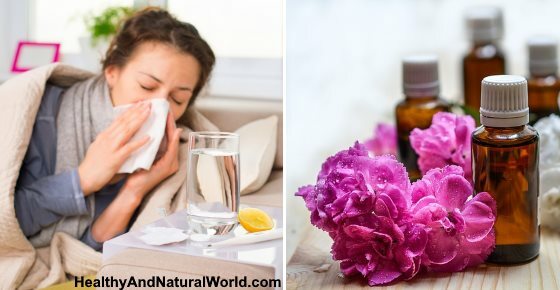 In this article, I am going to look at what scientific research says about the benefits of essential oils to treat flu and cold symptoms. You will also learn about the best essential oils to get rid of a sore throat, stuffed up airways, and soothe dry coughs. At the end of the article you will find detailed instructions on how to use these essential oils to relieve cold and flu symptoms. Suffering from the common cold or influenza virus can leave you feeling tired and weak with a blocked-up nose, muscle aches, loss of appetite, and a fever. You may also suffer from various aches and pains like headaches, earaches, and body aches. According to Dr. Steven Doerr from the Exempla Lutheran Medical Center in Wheatridge, Colorado, cold and flu viruses affect the upper respiratory tract. This causes inflammation in your airways, and your body produces mucus to fight the infection. This leads to typical flu-like symptoms, including stuffed up airways, blocked sinuses, or a dry cough. Cold vs. flu – what’s the difference? Because the symptoms of the common cold and flu are very similar, it’s is hard to know the difference. So, how can you know if you have the cold or flu? There are a number of great reasons to use essential oils to treat cold and flu symptoms. You can use a combination of essential oils to decongest your airways, relieve headaches and body aches, and as an expectorant. Let’s look in more detail at the 15 best essential oils for treating cold and flu symptoms. At the end of the article, you will find out some great home remedies for the flu that you can make yourself using essential oils. The home remedies are used in diffusers, massage blends, to relax in the bath, and inhale. Eucalyptus oil is widely used as a natural decongestant to help unblock stuffy airways, help you breathe easier, and break up phlegm and mucus which make it an excellent essential oil for colds and flu relief. If you have a blocked or stuffy nose, putting a few drops of eucalyptus oil on a tissue and breathing it deeply can be enough to help relieve congestion in your nose, sinuses, or upper chest. Peppermint essential oil is another natural remedy that has cold-fighting properties to relieve coughs, sore throat, and hoarseness. Peppermint oil is also one of my best essential oils to relieve muscle pain and inflammation. You can also rub a peppermint essential oil blend on your temples to relieve headaches and clogged sinuses. Tea tree oil is a powerful antiviral and antibacterial essential oil that is perfect to destroy cold and flu virus pathogens. Tea tree oil can be added to a steam inhaler or diffuser to help kill off germs in the air. Also, inhaling tea tree essential oil in a steam bath will reduce coughing, soothe sore throat, and act as a decongestant to clear mucus. You can also use a tea tree oil spray to disinfect surfaces to prevent the spread of cold and flu viruses. Rosemary is a fragrant cough-suppressing essential oil that can help to clear away phlegm, mucus, and reduce inflammation in your respiratory system making it a useful essential oil for colds and flu relief. In fact, rosemary is so effective at helping to get rid of coughing and getting rid of mucus, that I’ve included it in my best essential oils to treat bronchial infections. Oregano essential oil is an excellent essential oil for viral infections with cold-fighting properties to help clear up influenza virus and cold infections quicker. Another essential oil for cold and flu relief that destroys viruses is lemon balm. Lemon balm is also a mood-enhancer and can help improve your feeling of wellness while you are fighting a viral infection. So, adding lemon balm to your essential oil mix will not just kill off respiratory viruses quicker, but will help you feel better while you are recuperating from the flu. Frankincense is a healing essential oil that can get rid of congestion and get rid of a respiratory viral infection quicker making it a great essential oil for colds and flu relief. Frankincense oil is a natural disinfectant, antiviral, and anti-inflammatory essential oil. However, there are many other benefits of using frankincense as a home remedy for colds and the flu. The journal BMC Complementary Alternative Medicine reports that compounds in frankincense have an antiviral effect against the influenza virus.15 This means that inhaling frankincense can help to get rid of a viral infection in your airways and sinuses. A frankincense spray can also be used as an antiseptic to disinfect surfaces. Lavender can help in treating many of the symptoms associated with colds or flu like congestion, headaches, body aches, coughs, and insomnia. You can also use lavender as a muscle rub to help reduce stress and tension in aching muscles and joints. Lemongrass is a widely-used essential oil as an alternative medicine to help reduce inflammation, the effects of viral infections, and treat digestive issues. Among the cold-busting properties of lemongrass is its ability to reduce nausea, soothe headaches naturally, bring down your body’s temperatures, and ease muscle cramps. Lemongrass can help to treat cold and flu symptoms because it helps relax the mind and give you a better night’s rest. Getting plenty of sleep and rest are essential to helping your body fight a viral infection. Cinnamon essential oil has an antimicrobial effect to help beat the flu or cold virus. Cinnamon can also help improve your digestive system and help you regain your appetite quicker. Clove oil is a great essential oil for fighting the flu virus that also helps to relieve many symptoms of the common cold. Sandalwood can help to boost your mood while your body is fighting a cold or flu infection. Sandalwood essential oil also has a sedative effect that can help to reduce persistent coughing and sneezing. Basil is a fresh-smelling essential oil that can help to reduce nasal congestion and pain, as well as helping your body fight infection. You can help get relief from a stuffy nose, sore throat, and a cough if you use thyme as part of your essential oil blend for colds and flu symptoms. Ginger has many healing properties that are useful in treating many ailments, including the symptoms of the common cold and flu. You can also add ginger oil to your essential oil massage blend to help reduce the flu-like symptoms of muscles aches and pains. There are many ways that you can use essential oils to treat cold and flu symptoms and speed up your recovery time. Gargling with an essential oil mixture can help to kill off bugs that are causing a sore throat. Some essential oils will also help soothe any inflammation at the back of your mouth. Inhaling essential oils is a popular way to unblock sinuses and relieve stuffy airways. Usually, a few drops of a decongestant essential oil like peppermint or eucalyptus in a bowl of hot water is enough to help make breathing easier. Even adding some essential oils to a warm bath while you relax is a way to inhale the healing properties of essential oils. Massage essential oil blends or soothing muscle rubs can contain various essential oils that have pain-relieving properties. You can also add some eucalyptus to a chest-rub blend and let the vapors unblock your nose and break up phlegm in your respiratory tract. Let’s look at some easy natural remedies for treating cold and flu symptoms at home. Mix together 4 drops peppermint oil, 4 drops ginger oil, and 4 drops rosemary oil with 1 oz. (30 ml) carrier oil such as coconut oil or sweet almond oil. Massage some of the pain-relieving oil to the affected area until the oil is absorbed into your skin. Repeat 2-3 times a day until the aches and pains caused by the flu virus have gone. The massaging action helps to increase circulation to the sore muscles and the essential oils penetrate the skin and help relax muscles. If you want, you can exchange the essential oils for other pain-relieving essential oils that are mentioned in this article. For example, lavender oil, thyme, and eucalyptus oil all are great pain relieving essential oils. Use this essential oil blend to get rid of a backache, sore legs, or shoulder pain while you are fighting the flu virus. Mix together 4 drops sandalwood oil, 4 drops lavender oil, 4 drops lemon balm oil with 1 oz. grapeseed oil or sweet almond oil. Massage a little of the oil onto your temples frequently throughout the day to help reduce feelings of fatigue and low mood. Alternatively, you can add some of the above oils to your vaporizer and inhale to help give you more energy and lift your mood. Put a few drops of ginger oil and a few drops of cinnamon essential oil on a tissue. Inhale frequently throughout the day to reduce feelings of nausea. Put 3 drops of cinnamon oil and 3 drops of ginger oil in a large pot with water. Put a towel over your head and inhale the steam deeply to help reduce feelings of nausea. Many essential oils are great for getting rid of a sore throat that has been caused by a viral cold or flu infection. The combined effect of massaging an essential oil mix and inhaling the vapors can help to reduce the discomfort a sore throat causes. Mix 5 drops eucalyptus essential oil, 5 drops of your other favorite essential oil from this article with 2 tablespoons carrier oil such as coconut oil or sweet almond oil. Gently rub the remedy on to your neck, chest, and behind your ears to help treat the symptoms of a sore throat. Repeat 2 times a day until your cold or flu infection has gone. You can also find a great home remedy to make your own healing sore throat syrup at home. Add 2 drops of thyme oil or peppermint oil along with 1/2 teaspoon sea salt to a glass of warm water. Gargle the essential oil remedy for a minute or so to help soothe the pain in your throat. Repeat 2-3 times a day to help alleviate a sore throat and kill off any germs in your mouth. The strong and potent vapors of some essential oils help to break down mucus and phlegm and ease congestion. Some of the best essential oils for congestion are eucalyptus, tea tree, peppermint, and lavender oils. Mix 4 drops eucalyptus oil, 4 drops peppermint oil, and 2-4 drops lavender oil with 2 tablespoons sweet almond oil. Gently massage the remedy onto your chest and cover with a blanket. Or, you can massage the oil mixture on the soles of your feet and cover with socks before going to bed. To help reduce inflammation and irritation at the back of your throat that is causing a cough, you can use essential oils that have antibacterial and anti-inflammatory properties. Inhaling essential oils like tea tree oil, lavender, lemongrass, or cinnamon can help to get rid of any respiratory infection that is making you cough up phlegm or have a dry cough. Put 4 drops tea tree oil and 4 drops of either lavender, lemongrass, or cinnamon oil in your diffuser. Inhale deeply to help the healing power of the essential oil blend soothe your throat and respiratory tract. You can also try using peppermint oil, eucalyptus oil, or any other of the essential oils for flu and cold symptoms that are mentioned in this article. You can also try my highly effective garlic syrup for chest infections to get rid of a chesty cough for good. Soaking in a bath with essential oils is great to soothe aching muscles caused by flu, relax your mind, as well as inhaling the essential oils to ease congestion and blocked sinuses. Mix 10-12 drops of essential oils from the above list with 1 oz. (30 ml) of a carrier oil and add it to your bath water (you can also add 1 cup of Epsom salt to enhance the effect of relieving body aches and sore muscles). Usually, home remedies are enough to alleviate the symptoms of a cold or flu virus. The antiviral and antimicrobial effect of many essential oils will also help prevent an upper respiratory tract infection from getting worse. You have a high fever along with a sore throat, persistent cough, and congestion in your chest. Your cold or flu symptoms last longer than 10 days. You have a severe earache or drainage from one ear. Your cough won’t go away. You bring up mucus or phlegm from your chest. Am Fam Physician.2006 Oct 1;74(7):1179-1180. BMC Complement Altern Med.2010 Nov 15;10:69. Evid Based Complement Alternat Med. 2016; 2016: 3012462. Med J Nutrition Metab. 2011 Dec; 4(3): 211–218. BMC Complement Altern Med. 2010; 10: 69. Evid Based Complement Alternat Med. 2016; 2016: 7896081. Indian J Pharm Sci. 2009 Mar-Apr; 71(2): 134–136. J Adv Pharm Technol Res. 2011 Jan-Mar; 2(1): 3–8. J Tradit Complement Med. 2012 Jan-Mar; 2(1): 27–32. Eur J Dent. 2013 Sep; 7(Suppl 1): S71–S77. Anc Sci Life. 2014 Jan-Mar; 33(3): 151–156. I’m glad to read such a structured informaition about oil’s effect. Want to read more special articles at your site.Thank you for sharing! Great article & sound advice. Thank You! !